Nanoclusters are made when different nanoparticles and agents are linked together. Gold nanoparticles were linked to a short protein (DAPTA peptide) that binds to C-C chemokine receptor type 5 (CCR5), as well as a PET imaging agent, 64Cu. CCR5 has been identified as a biomarker for triple-negative breast cancer. 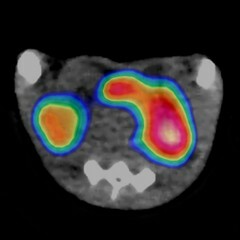 This PET/CT image of the targeted gold nanocluster (64Cu-AuNCs-DAPTA) was acquired 24 hours after intravenous injection in a mouse model of triple-negative breast cancer. The image shows specific tumor accumulation of the nanoclusters (left side, contrast area).